May Allah's (swt) peace and prayers fall on the Master of the Messengers, the leader to the pious people, his family, and his companions and upon everyone who makes da'wa with his message, and who confines himself to his method, and follows his steps and takes the Islamic creed as the basis for his thoughts, and the divine rules as the standard for his actions and as a reference for his opinions and rules. As-Salamu Alaikum Warahmatullahi wa Barakatuhu. We ask Allah (swt)  to ensure that our gathering is completely for His sake and to give us the good for Islam and Muslims. We ask Allah (swt) to reveal to our sight the truth as truth, and give us the strength to follow it, and show us falsehood as falsehood, and give us the strength to avoid it. Dear brothers and sisters, the vital issue for Muslims in the whole world is the re-establishment of the rule of Allah  through establishing the Khilafah "Caliphate", and appointing a Khalifah for the Muslims, who is given the pledge (Bai'a) on the Book of Allah and the traditions (Sunnah) of His Prophet (saw), in order to demolish the rules of Kufr and to replace them with the laws of Islam both in implementation and application, to transfer the Muslim lands to Dar ul-Islam (Land of Islam), to make the society in Muslim lands an Islamic society, and to carry the message of Islam to the world by invitation and Jihad. By defining what is the vital issue for Muslims, the objective will also be defined, for the achievement of which those who carry the Islamic call have to strive, as groups, parties and structures. Consequently the method which they have to follow to achieve their aim will also be defined. In order to understand all this we have to be aware of the present situation of Muslims and the reality of Muslim lands; and the situation of these lands, the reality of the society in which Muslims live nowadays, and thereality of the divine rules which are connected to all of these things. Although there are Muslims, their lives are characterised anddominated by a mixture of Islamic, western, socialist, nationalist, partisan, regional and sectarian thoughts and emotions. When we look at the Muslim lands, which are primarily the Arab areas, they are unfortunately all governed by the laws and systems of Kufr except for some Islamic laws, such as the laws of marriage,divorce, wife's financial support, inheritance, guardianship etc. All of these are implemented by specially appointed courts called divine courts (Mahkamah Shari'ah). There are also some other divine rules that are applied in the courts of some Muslim countries such as in Saudi Arabia and Iran. Regarding these lands in which Muslims currently live throughout the world, their reality is that they are all Dar ul-Kufr (land of disbelief) and not Dar ul-Islam (land of Islam). In order to understand this situation we have to understand the reality of Dar ul-Islam and the reality of Dar ul-Kufr according to theviewpoint of Shari'ah. According to the divine terminology, Dar ul-Islam is defined as the land which is governed by the laws of Islam and whose security (Aman) is maintained by the security of Islam, i.e. by the authority and protection of Muslims inside and outside the land, even if the majority of its inhabitants are non-Muslims. According to the divine terminology Dar ul-Kufr is the land which is governed by the laws of Kufr, and whose security is not maintained by the security (Aman) of Islam, i.e. by other than the authority and security of Muslims, even if the majority of its inhabitants are Muslims. What is meant by resuming the Islamic way of life is that Muslims should return to acting according to all the rules of Islam. Whether they are creeds, worships, morals, transactions, systems of ruling, economy, social system, education or foreign policy with other nations and states, and also to transform the land of Muslims to Dar ul-Islam and change the society in these lands into an Islamic society. Resuming the Islamic way of life would not be achieved exceptby establishing the Khilafah "Caliphate" and appointing a Khalifah for the Muslims, who should be given the pledge (Bai'a) to be listened to and obeyed based upon the Book of Allah (swt) and the Sunnah of His Prophet. 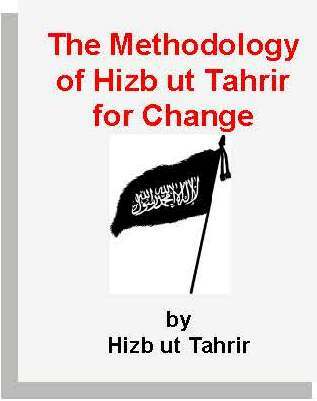 When Hizb ut-Tahrir, from this study, managed to define the vital issue for the Muslims and consequently to define its aim, and the goal which it acts to achieve; through this, it was able to understand the method which it has to follow in order to achieve the goal. This is represented by the method which the Prophet  followed in his activity from the moment Allah (swt) sent him as a messenger until he achieved the establishment of theIslamic state in Medina. This action to resume the Islamic way of life should be undertaken collectively; it is not allowed to be an individual activity, because it would not be possible to achieve the goal through individual activity, no matter how exalted the thoughtand mind of the individuals; rather they must work within a group. Therefore, the activity for re-establishing the Khilafah "Caliphate" and reestablishing the rule of Allah (swt)  is a collective activity. It should be done within a structure, party or group. This work in a groupmust be political and should not be other than political, because establishing the Khilafah "Caliphate" and appointing a Khalifah is a political activity, and because ruling with what Allah (swt)  has revealed is apolitical activity as well, and they would not be but political activity.